My youngest, Maegan age 4 loves the Twirlywoos so she was really excited about reviewing the DVD with me. It's fun and colourful and the adventures the Twirlywoos have are very entertaining! Meg loves the Full episode the most because she thinks its funny watching the Twirlywoos fill things up with tea! Maegan thinks all the characters are cute and she says they are birds - This is one of those DVD's that will keep her entertained long enough for me to start cooking dinner! Laugh along with the adorable antics of hit CBeebies comedy pre-school series Twirlywoos in their first collection of DVD tales. 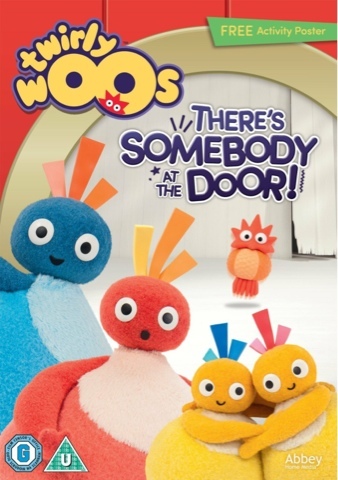 Twirlywoos - There’s Somebody At The Door is released by Abbey Home Media on Monday 5th October. Twirlywoos features the fun-filled adventures of four, fruit tea loving bird-like characters: Great Big Hoo, Toodloo, Chickedy and Chick. Home to the Twirlywoos is the Great Big Boat, manned by the Hooter and the three Quacky Birds. The Big Red Boat has a plentiful supply of their favourite fruit tea, and a host of secrets and surprise visitors. Silly, fun and full of surprises Twirlywoos is made by children’s TV specialists Ragdoll Productions and devised by Anne Wood (Teletuubies, In The Night Garden) and Steve Roberts (Dipdap), and is narrated by Linda Bassett. Combining stop-frame animation and live-action sequences set in the real world, the series uses fun and laughter to encourage pre-schoolers to think for themselves and gain confidence in their perceptions of the world. Underneath - The Twirlywoos learn about underneath when they visit a hat shop. Back in the Boat, the Box brings a rainbow for the Twirlywoos to dance underneath. Round and Round - The Twirlywoos have fun on a roundabout, and are visited by the Stop-Go Car who chases them round and round the Boat. Connecting - The Twirlywoos use a shoelace to connect some people together at a bus stop. Back in the Boat, the Very Important Lady falls apart, and it’s up to the Twirlywoos to connect her pieces back together. Through - The Twirlywoos see a postman putting letters through a letterbox and decide to copy him. Back in the Boat, the Twirlywoo Screen gives the Twirlywoos a door to go through. Full - The Twirlywoos see someone fill a glass with water, and get carried away finding their own containers to fill. Back in the Boat, the Twirlywoos have too much tea, and get full up themselves! Behind - The Twirlywoos entertain a baby – and confuse her dad - by popping up behind him. Back in the Boat the Twirlywoos Screen draws a wall, with someone unusual hiding behind it. Wrapping - The Twirlywoos see someone wrapping a present, and get carried away trying to wrap things of their own. Back in the Boat, the Stop-Go Car brings them a long scarf that they all get wrapped up in. Upside Down - The Twirlywoos learn about upside down when they watch a gallery owner hanging some paintings. Back in the Boat they help put the Very Important Lady the right way up. Disclaimer: I received Twirlywoos - There’s Somebody At The Door DVD for the purpose of this review.